55 years ago, at about 1:30 pm, Pan Am Flight 101 landed at New York’s JFK Airport, carrying some precious rock n roll cargo. The Beatles were arriving from London and getting ready to set foot on U.S. soil for the first time. They were already drawing crazy crowds in the U.K., but they weren’t sure what, if anything awaited them here. 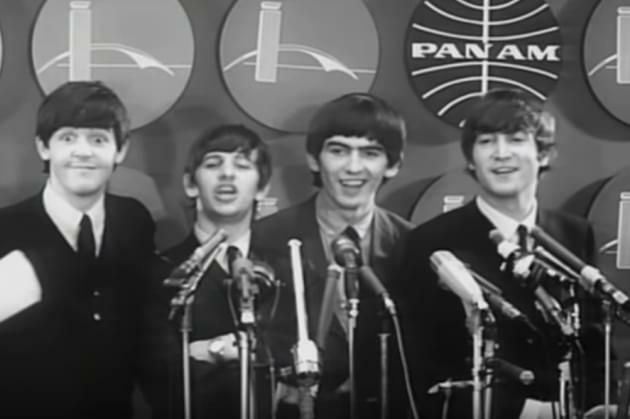 Just before landing, the pilot told the boys that it looked like they had a lot of fans waiting for them at the gate, and a feeling of relief came over Paul, John, Ringo and George. The Fab Four stepped out into a mad scene, with a crowd of 3,000-5,000 screaming teenagers in full throat. The crowd had pushed through security barricades. Over 200 media members and 100 NYC cops also took in the historic moment. A couple nights later, The Beatles, fresh off their first U.S. #1 hit, “I Want To Hold Your Hand,” played for the first time to an American TV audience and a live screaming (again) crowd in New York. The Ed Sullivan show on February 9, 1964, drew about 40% of the U.S. population to it – about 73 million viewers – to see what all the fuss about the lads from Liverpool. Below is the video of their impromptu airport press conference, showing off their sharp sense of humor.